The following map illustrates where patients obtain their hospital care when they seek care in Kansas. In 40 of the 105 Kansas counties, over 50 percent of the residents remained within their county for hospital care. 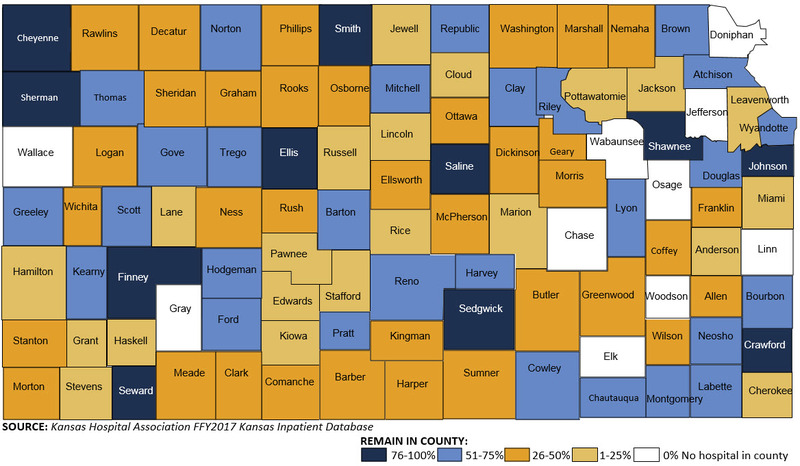 Twenty Kansas counties with hospitals retained 25 percent or less of their county discharges while 12 Kansas counties retained over 75 percent. Nine Kansas counties do not have hospitals within their borders: Chase, Doniphan, Elk, Gray, Linn, Osage, Wabaunsee, Wallace and Woodson. The patient migration to surrounding states for inpatient services showed a slight decrease from 25,123 in 2016 to 24,908 in 2017. The in-migration from Missouri increased from 25,053 in 2016 to 26,666 in 2017.